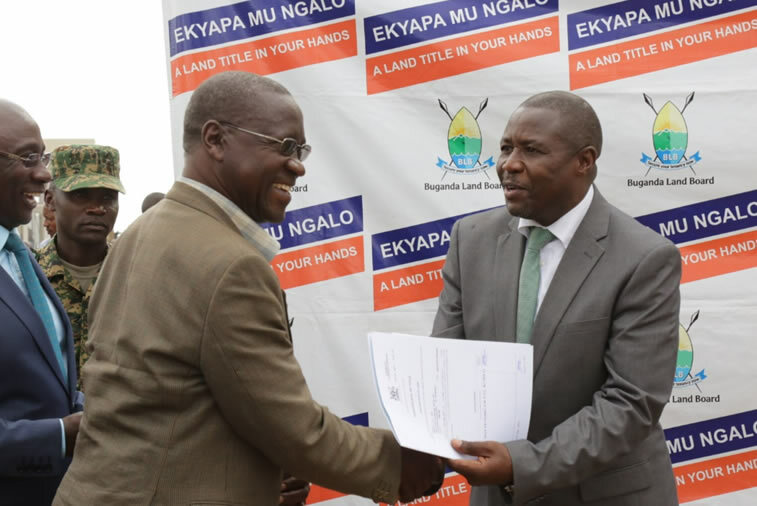 The deputy minister of Lands, Agriculture and Environment in Buganda kingdom Hamis Kakomo has urged Ugandans to safeguard their land by obtaining authentic documentation. Kakomo was speaking at Masengere building in Bulange Mengo as chief guest where Buganda Land Board issued over 200 lease titles to tenants on Kabaka’s land. 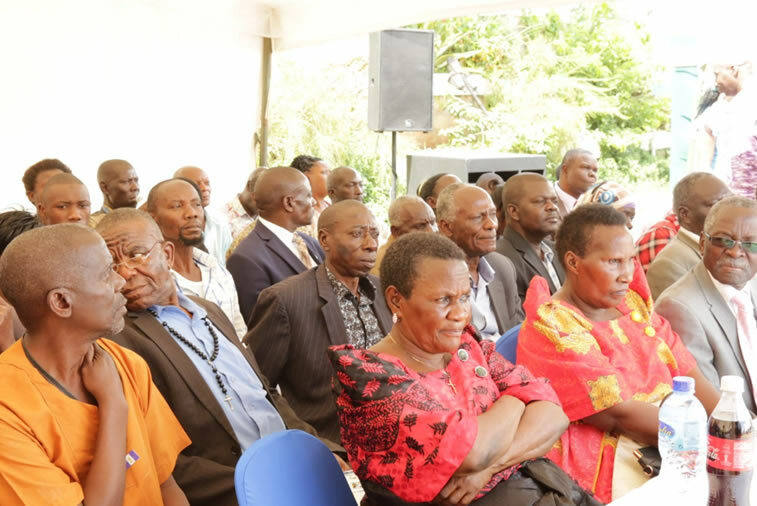 The minister said that leasing is an old practice done by all landlords, thereby advising all people with potential to obtain titles on Kabaka’s land to disregard naysayers and apply for them. Owek.Kakomo giving out titles to clients whose titles came out. He mentioned the importance of owning a land title which includes security of tenure, ability to acquire credit from financial institution and avoidance of land conflicts since titled land is clearly demarcated. “Buganda Land Board does not print titles; only government does. BLB just facilitates title processing by following all legal procedures,” said Kakomo, who was representing Land, Agriculture and Environment minister Eng Martin Kasekende. In similar fashion, Prince David Wassajja applauded Buganda Land Board for professionally managing Kingdom land. He made reference to a comment from officials of the ongoing probe commission on land matters led by Justice Catherine Bamugemereire who said that throughout their investigations in land management over the past one year, BLB comes out top. “Please stop relying on the old system of sale agreements and verbal agreements over land. Today everything is about documentations,” he said. “How are you going to attract investment on your land if you have no land title? How are you going to get money from the bank to develop your land without a titles?” he wondered. Omulangira David Kintu Wasajja handing over titles to clients. 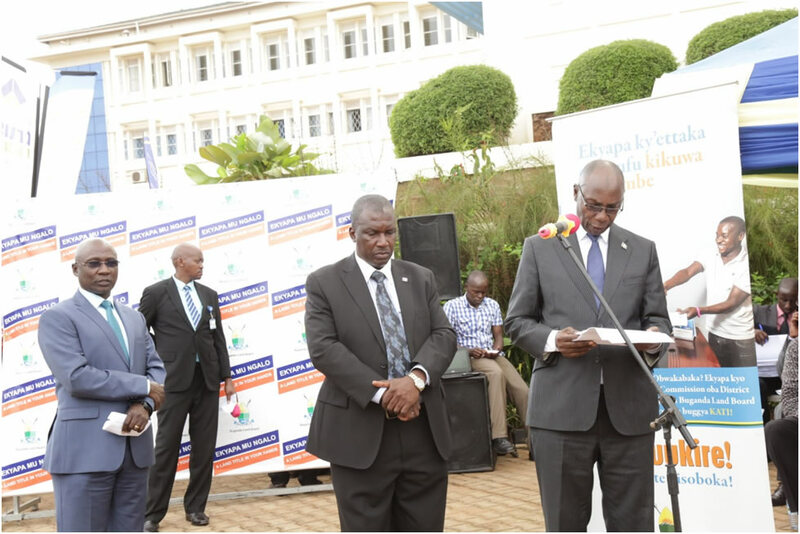 He, therefore, urged people to stop listening to critical voices about Buganda’s lease titles and go for them because in the developing world, land documentation is a requirement rather than a luxury. 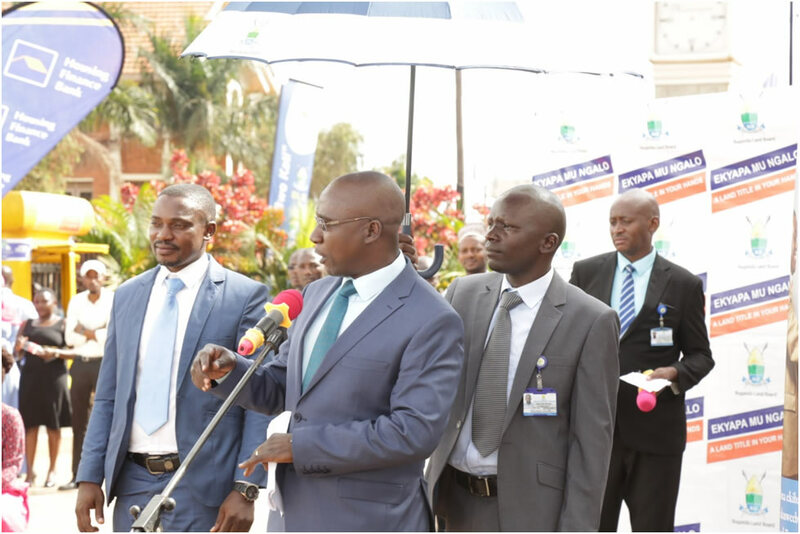 “We would also want to thank Buganda Land Board for their transparency in land management. We have seen many duty bearers found culpable by the land inquiry, but BLB has made us proud,” he added. 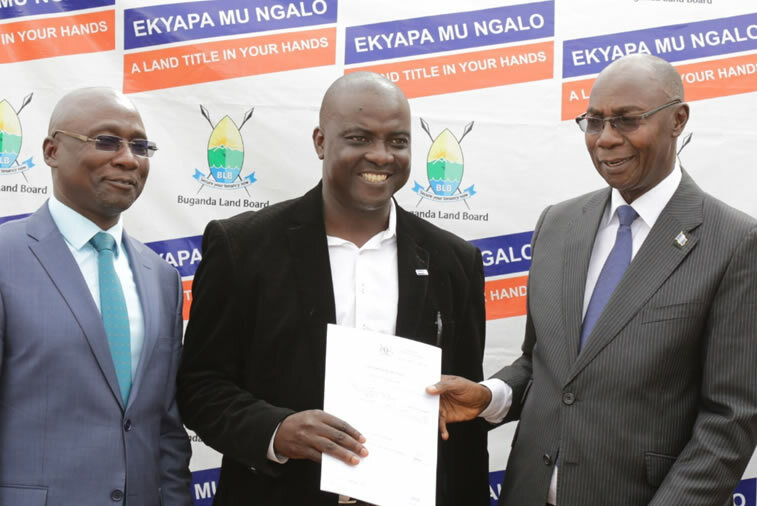 Meanwhile, Buganda Land Board Managing Director David Kyewalabye-Male capped it all by equating the acquisition of land title to getting a degree of education. He said that while other land transactions may be permissible by law, the most important one is a title. He also mentioned various financial institutions such as Finance Trust, Centenary Bank and Housing Finance Bank who partner with BLB in its Lease Access Financing Initiative. This initiative helps people without money to obtain land titles to apply to financial institutions and get loans to get these titles and pay later. The function attracted hundreds of tenants on Kabaka’s land who expressed relief and joy for finally obtaining their titles. Other guests included Wakiso LC5 chairman Matia Lwanga Bwanika, Ssebwana Kiberu Kisiriza, Ssekiboobo Alex Kigongo, Makindye Ssaabagabo MP Emmanuel Ssempala Kigozi Ssajjalyabeene. Wakiso district chairman Matia Lwanga Bwanika giving out titles to Buganda Land Board clients. 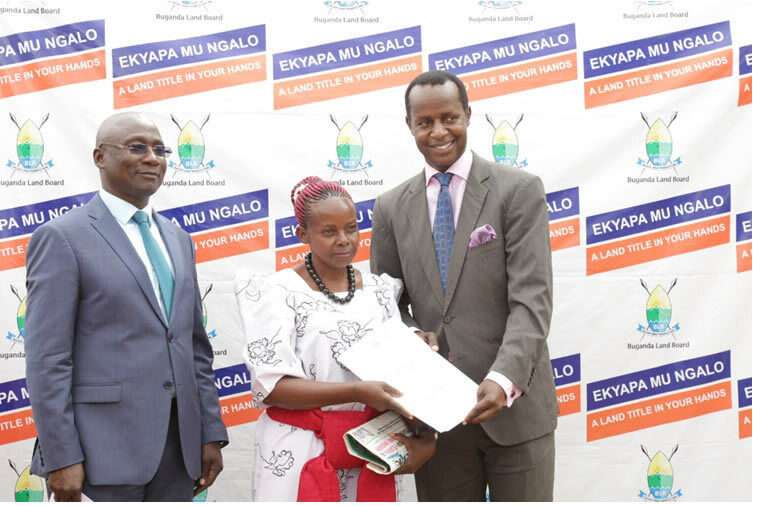 Most of the titles were a product of last year’s ‘Kyapa mu Ngalo’ campaign in which BLB allowed tenants to apply for lease titles at a subsidized fee. In 2015, BLB also carried out a mass registration and survey campaign in which over 130,000 people registered their bibanja and another 21,000 registered for survey. The process of acquiring a land title is a long one, sometimes taking over a year, especially due to delays caused by the lack of capacity in government land offices. A cross-section of people who attended the ceremony.